Trusted Training 4 U is a provider of workplace training courses for management and employees, Our full range of courses cover first aid, paediatric first aid, fire safety, food safety, health & safety, employee training and care home training. All of our training courses comply with current legislation and all candidates will be awarded with in house certificates of the accreditation required, CIEH, QUALSAFE, TQUK… We also offer train the trainer courses if you are interested in becoming a professional trainer. 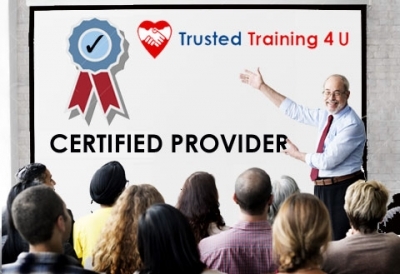 Trusted Training 4 U also offer a modern alternative to workplace training with E-learning. Electronic learning (e-learning) has advanced so that training courses can now be used on any device, anywhere, with the latest technology to engage all employees, which means you don’t need to shut down your business to hold a training session with all staff.